Edko Films Ltd. 安樂影片 Opens FRONT COVER in Hong Kong! 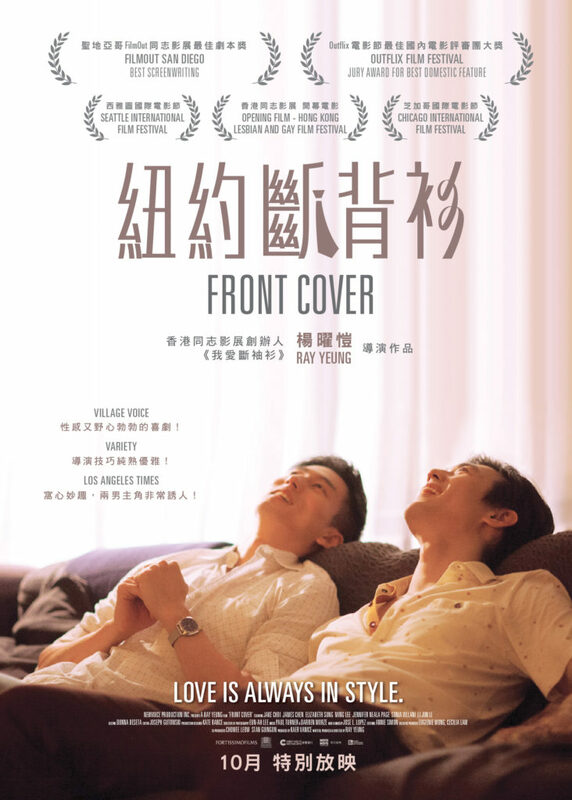 Front Cover was the Opening Film at the 2015 Hong Kong Lesbian & Gay Film Festival. Since then, the film has traveled to many cities around the world in the Film Festival circuit and has had successful runs in New York City, Los Angeles, San Francisco, Honolulu, Washington DC, and Bangkok. Front Cover will make the anticipated return to HONG KONG on October 25, 2016 for it’s theatrical run! 12:40 PM at UNCSA’s ACE Theatre Complex (Gold)! We are going back to CANADA Thursday October 13th for a screening at Reel Pride Winnipeg in Manitoba! This is our last screening in Canada! Thursday Night Is Date Night! Bring A Date And Get Two Admissions For Only $10. Use Discount Code “Datenight” To Buy Your Tickets Online. Strand Releasing’s FRONT COVER is Officially Available in North America on Netflix, Amazon, iTunes and Vimeo. If you didn’t get a chance to see it during our limited runs in selected cities or in any of the Film Festivals we screened in, make sure to put Front Cover on your “must-see” list! FRONT COVER will be screening at the Taiwan International Queer Film Festival (TIQFF) in the Taipei ShinKong Cinemas! Director Ray Yeung will be at the October 30th screening for Q&A after the screening. We are back in Florida as part of the TampaBay International Gay & Lesbian Film Festival! FRONT COVER is taking part in the Indiana Cares Campaign Film Festival in Pennsylvania this Sunday, October 2, 2016 at 6PM! Please come support the Indiana Cares Campaign and see FRONT COVER!